An iced tea maker can make your life a lot easier, not to mention more refreshing! These devices brew your tea and give you a perfect container to chill it in. We’ve done all of our research to bring you these iced tea maker reviews. We know that you’ll find your new favorite tea-making device on our list! Before we get started, here are some things that you should keep your eye on as you shop. Capacity: How much tea can it make at once? A bigger iced tea maker will mean that you have to make tea less often, and it can be useful if there are more people drinking it. 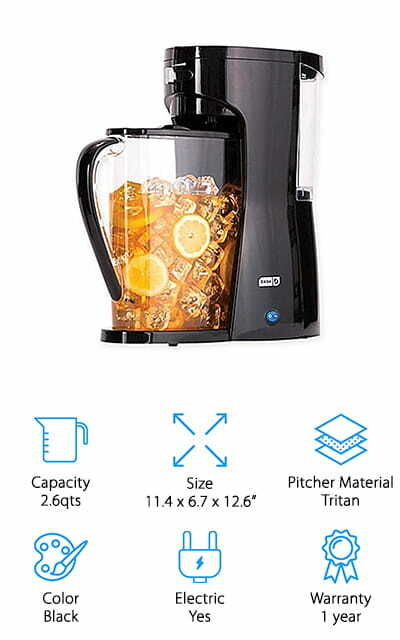 Size: The size of the iced tea maker can also tell you where you’re going to put it in your kitchen. If you have limited counter space or need a maker that you can easily store, check this information. Pitcher Material: What is the pitcher made of? They are usually made of either glass or plastic, and this can affect the price quite a lot. Choose the one that you prefer to use during your tea-making experience. Color: What color is the tea, maker? Some have cool colors, while others are stainless steel, white, or black. Again, this has a lot to do with personal preference. Some may even have alternative color options to choose. Electric: Electric iced tea makers will brew the tea for you, giving you the chance to chill it once it has been brewed to perfection. Non-electric ones generally allow the tea to steep in already-boiling water, so choose your preferred method. Warranty: A warranty is a guarantee that the company stands behind their product with no questions asked. If it breaks during this warranty period during normal use, you could get a refund or replacement iced tea maker. Now we can get to the iced tea maker reviews! These amazing machines can fulfill all of your iced tea needs! We’ve brought you only the best so you can get the best iced tea possible. Our top pick and budget pick are our personal favorites, so check them out before you go through the rest of the list. Refreshment waits, so get your glasses ready! We’re sure that you’re going to find your new iced tea maker here! What is the best iced tea maker? The choice is yours, but our top recommendation is this maker by Breville. There are a ton of different features that come with this tea maker, and the one that stands out is that it doesn’t just make iced tea! This brewer is actually set up to make regular tea, which you can, of course, chill after it’s finished. But this way, you can have both warm tea and iced tea whenever you want them! 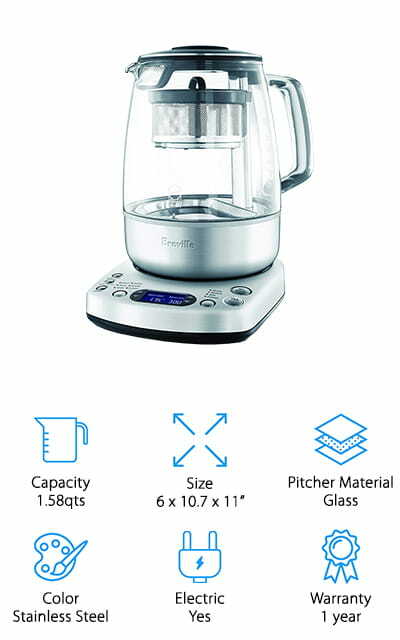 It has an auto-start function, as well as a 60-minute Keep Warm feature so that your hot tea stays hot for some time after brewing. Your loose tea leaves can be infused exactly how they were meant to be with a fully automated basket and exact water temperatures for tea perfection! If you love tea, you are definitely going to love this revolutionary tea maker. You can even time it to wake you up in the morning! If you’re into making a large amount of tea at the same time, you’re in for a treat! This Mr. Coffee 3-Quart Iced Tea Maker can make large quantities of tea at the same time, and if can brew it from tea bags or loose leaf tea. The brew basket is removable for easy-loading, and after the brewing cycle is complete it automatically shuts down so your tea doesn’t over-brew. You can also use it to make a single serving or double serving rather than the entire pitcher. Amazingly enough, you can also use it to brew coffee! Pour your hot tea in on top of ice and all of your favorite extra ingredients to get the perfect cup of iced tea. You can do the same thing with coffee! It has a programmed cleaning cycle for help with descaling every so often. Plus, the pitcher that comes with the maker can be thrown into the dishwasher! 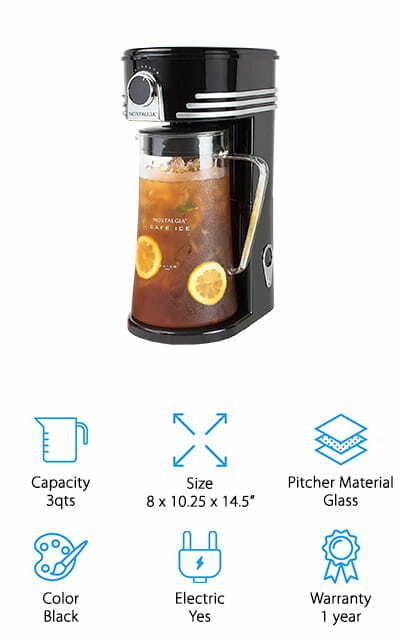 This electric iced tea maker from Hamilton Beach makes brewing your favorite drinks easy. To make iced tea in as little as ten minutes, make sure that you fill the pitcher with ice cubes before brewing. After the brew is completed, the power on the unit shuts down so that you can safely enjoy your beverage. You can use this brewer with either loose tea or tea bags, depending on how you like your tea brewed. The two-quart pitcher is slim enough to fit right in your refrigerator door so that you can have easy access to your beverages. There is an indicator light so you can tell when it’s on, as well as an automatic shutoff. You can adjust the brew strength to make sure that you’re getting your perfect tea. One of the coolest parts about this iced tea maker is the fact that it folds up so that you can store it easily. Ovalware makes this glass iced tea maker that makes about 1.6-quarts of iced tea at a time. 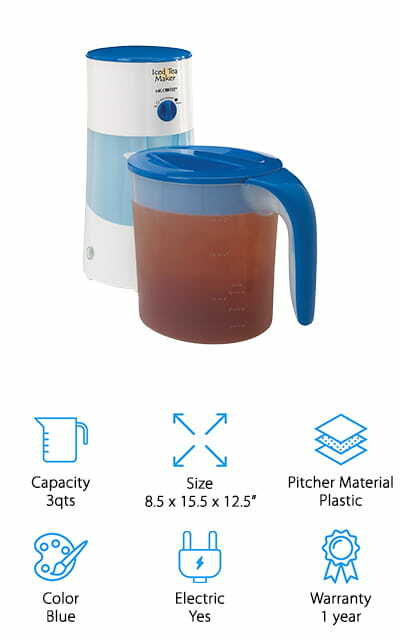 The pitcher has an airtight seal so that your tea stays fresh and flavorful for longer. You can also use it to make coffee if you’d like. You can use loose-leaf tea as well as tea bags to make any type of tea you’d like, meaning that you can use it as a traditional teapot or you can use it as a cold brew iced tea maker to make tea in the fridge. The pitcher is made with thick glass, with a BPA seal. The pitcher, then, is dishwasher safe so you can easily clean up after you brew your tea. We love that you can choose how you want to brew your tea depending on how you like it and that you can make your favorite coffee as well! You’re going to love how your favorite beverages taste. Takeya makes this amazing iced tea maker that comes in a variety of colors, from the black that is shown here to green, blue, and berry versions to give your kitchen a pop of color! 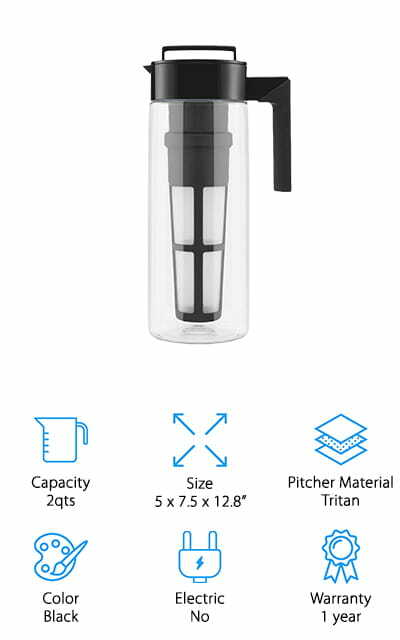 The Tritan pitcher is BPA free and dishwasher safe, with a leakproof lid that is airtight. Your delicious tea concoctions will stay fresh that much longer. You can use the fine-mesh infuser with either loose leaf or bagged tea – the choice is entirely yours! You can switch out the water bottles and tumblers for different sizes and pitches, allowing you complete customization from your Takeya iced tea maker. You can make 2-quarts at a time, and your tea will be ready in just a few moments. It’s small enough to store on your fridge door or even on its side in your fridge so you can have all of your tasty drinks on hand whenever you need them. You’ll love it! West Bend makes this great Iced Tea Maker with a glass pitcher and a sleek black design. It’s not quite a 1 gallon iced tea maker, but it can still make up to 2.75 quarts of your favorite beverage at once. You can select the brew strength from the menu and use it for either your iced coffee or iced tea. Controlling the brew time and strength can help you get the drink that you want without the guesswork. You can use bagged tea or loose tea, whichever you prefer, to make some wonderful drinks. You can also use the infusion tube to customize the flavor after brewing with fruits or herbs so that you always have the perfect cup of tea no matter what that looks like for you. 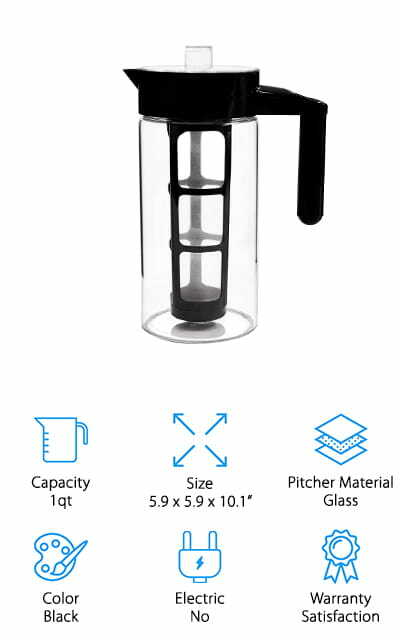 The mesh filter can be taken out to clean, and the lid on the pitcher stays on even when the tea is brewing. That’s pretty amazing! Dash’s Iced Beverage Maker is a great device for getting all of your cold beverages into your hand faster. The pitcher included is one of the only ones on our list that’s made of Tritan and can hold about 2.6 quarts of beverage. You can turn it on with the simple touch of a button. You can use it to make coffee and tea, from loose leaves or tea bags (and, of course, grounds). Tritan is dishwasher safe, so you can definitely put the pitcher right into the dishwasher when you’re through with it. The removable filter can be reused, as well as the brew basket. You don’t have to waste paper filters anymore! Furthermore, the pitcher is thin enough to fit comfortably right in your refrigerator door so you can always have access to your delicious creations. 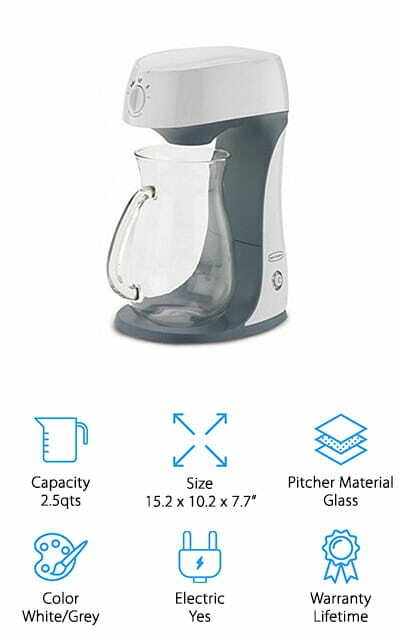 You can even adjust the brew strength to your personal strength with this amazing iced tea maker! The Nostalgia Café Iced Tea Maker can make an amazing 3-quarts of drink at full capacity, which means that it’s almost large enough to be a commercial iced tea maker. You can use it to make iced coffee, teas, and lattes as regularly as you want. You can use the filter basket that is included with ground coffee, tea bags, and loose leaf teas as well. You can select the strength of the brew with the dial, so you can make the tea or coffee that you want. 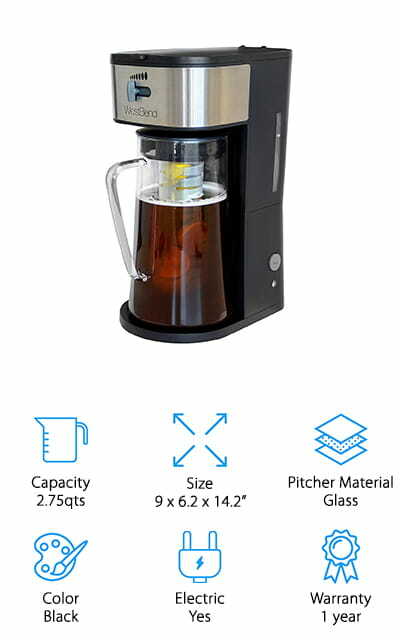 It has an auto-shutoff feature when the brewing is finished, so you don’t over-brew your tea or coffee. The water distribution system allows water to be pulled through all parts of the grounds or leaves, giving you the best possible flavor and using your leaves or grounds fully. The three-position lid gives you the ability to pour just liquid, or to pour a drink with ice if that’s what you like. When it comes to the basics, this electric iced tea maker has it all. The pitcher is made of a thick glass that isn’t going to break easily if it accidentally falls over. That’s pretty amazing. You can choose the brew strength for your tea so you always get the perfect cup, and you can choose to brew with bagged tea or loose-leaf tea, depending on what is available and which is your favorite. It can hold about 2.5-quarts of drink at one time, which is great if you often entertain or if you’re going to drink a lot of tea very quickly. Add sweeteners or flavor additions later for the perfect cup of your favorite beverage. This is a larger iced tea maker than some of the others on our list because of the capacity it can hold, but it’s still pretty simple and effective for getting the job done. You’re going to love having fresh iced tea! Zell’s cold brew iced team maker doesn’t work like the electric makers on this list. This tea maker works to gently infuse your tea or coffee to make a rich, powerful brew that you’re going to love enjoying no matter what time of the day it is. It includes a stainless steel filter so that you can make a concentrated brew without grounds or loose leaves in your drinks. 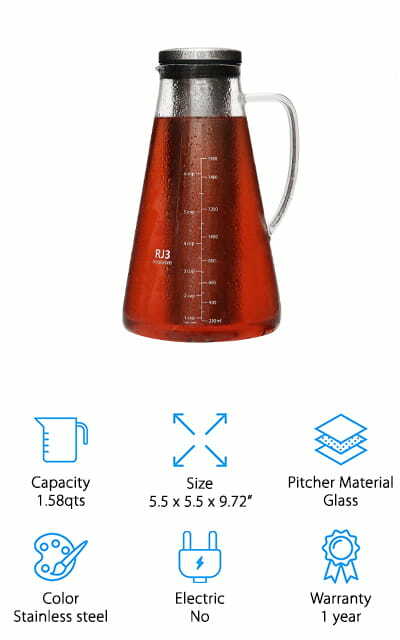 The pitcher is made of strong borosilicate glass with a no-spill lid so that you can pour it easily. If you want to make fruit-infused water, you can use this maker as well! All you have to do is put a fruit infusion filter into the machine instead of the coffee filter to make fresh fruit-infused water, herbal drinks, and even fruity iced teas. 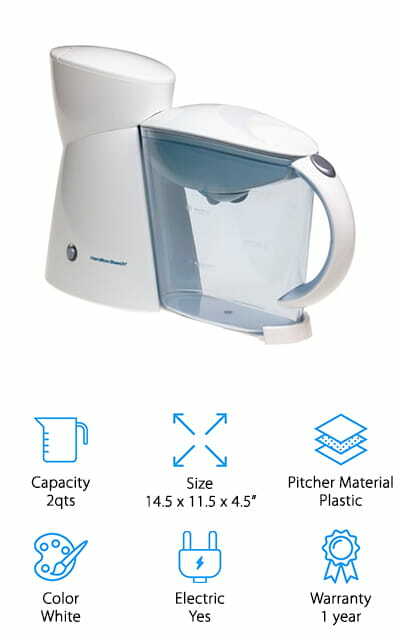 It’s super easy to clean this maker as well, as the pitcher and filter are dishwasher safe for easy clean up after your drinks.